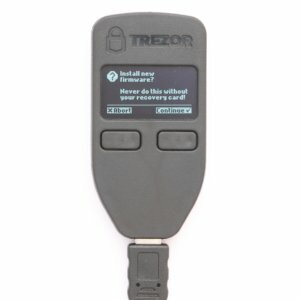 TREZOR is probably the best known and first hardware wallet. It was invented by slush, who is still the CEO and IT developer in his company SatoshiLabs. 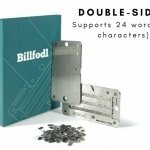 Whether the hardware wallet will keep its reputation, you can read in the following review. TREZOR offers its wallet in its own online shop for 83,49 € (click here to check the current price). Shipping is possible to many countries and will be charged additionally. Depending on the stock, the colours white, grey and black are available. 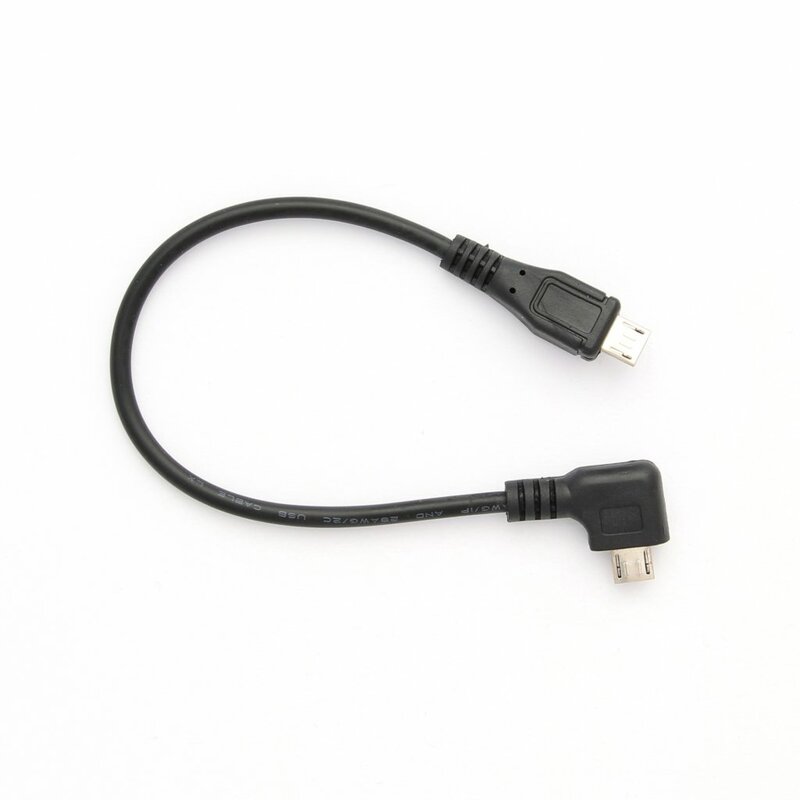 An OTG cable for Android smartphones to use the hardware wallet on the go. You can add this item in the checkout process. Cryptosteel (to test report), which allows you to keep your Recovery Seed safe from the elements instead of writing it down on paper. 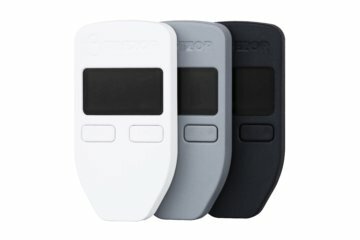 TREZOR also has a close network of resellers all over the world. 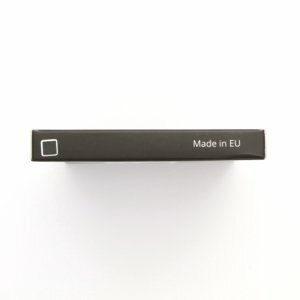 They purchase hardware wallets at better conditions and then resell them in their respective countries. 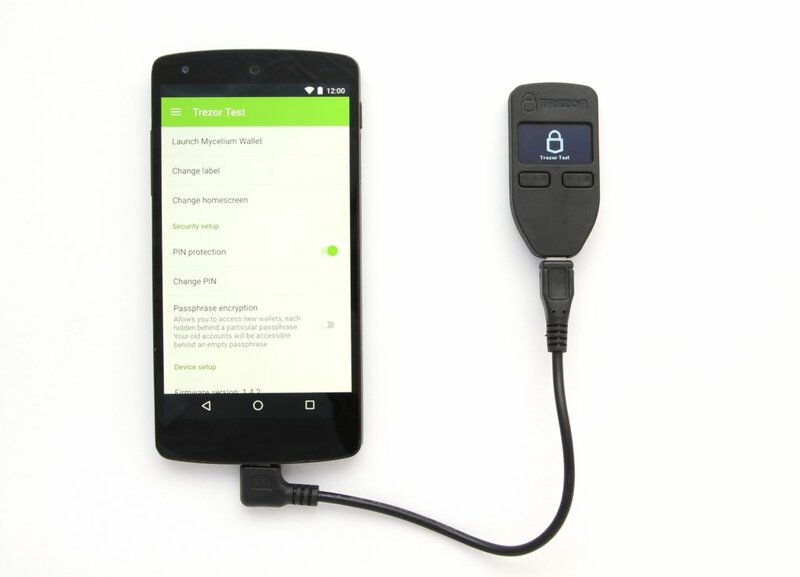 For this test TREZOR provided me with the hardware wallet in black including the OTG adapter for Android. After three days the package sent from the Czech Republic has already arrived. In the small envelope, which fits directly into the letterbox, you will find the hardware wallet and the OTG adapter, which has to be ordered separately. 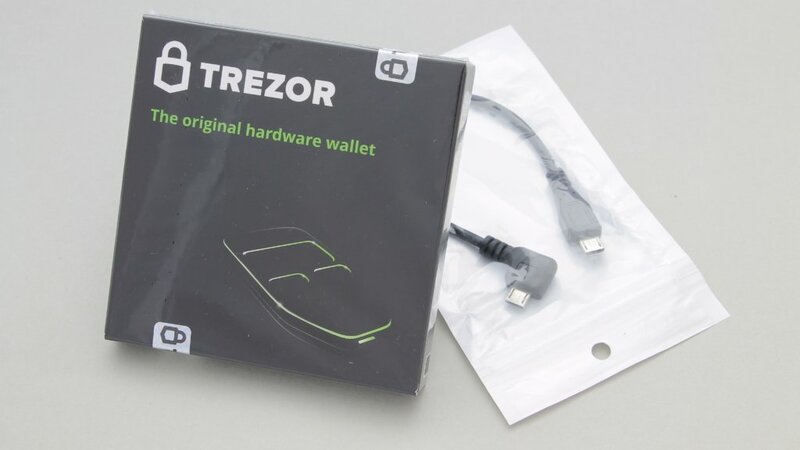 The hardware wallet is packed in a simple cardboard box, which is completely sealed into foil. The seals are located underneath the protective film. You should take the note on the back of the package seriously and contact support if any of the seals are broken. 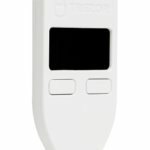 In this case, the device may have been tampered and TREZOR will take care of solving the problem. On the side is also a small sticker showing the color. You should check this again before opening it. If you break the seal and open the additionally glued cardboard box, the entire scope of delivery jumps directly towards you. It is safely embedded in a foam wrapping and thus packed in a shock-proof package. 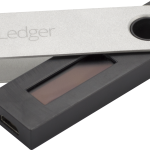 The hardware wallet itself, which is covered with a foil to protect it from scratches, is of course included in the delivery. 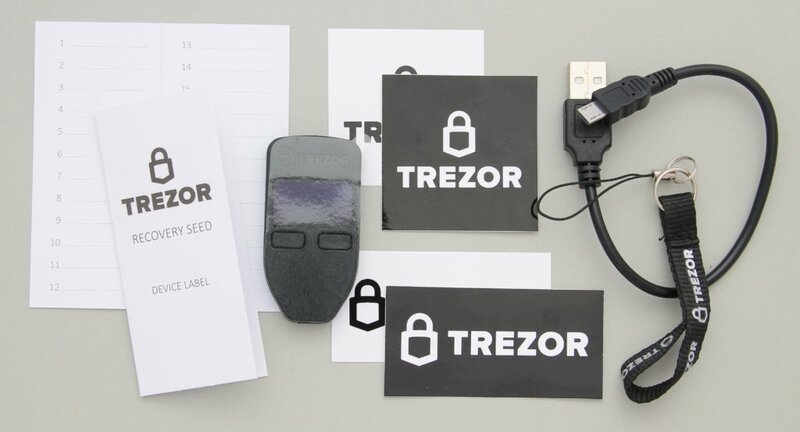 It also includes four stickers with the TREZOR logo, a USB-to-Micro USB cable to connect to the computer, two notes to write down the Recovery Seed and a small ribbon to attach to the TREZOR. 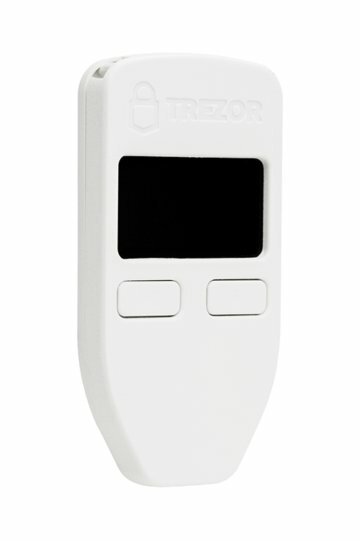 I was surprised how small the TREZOR is in the end. 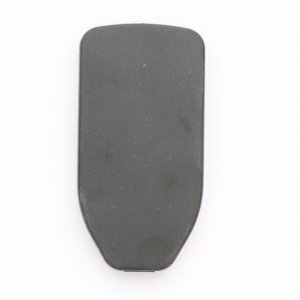 It is 60mm x 30mm x 6mm in size and weighs only 12 grams. 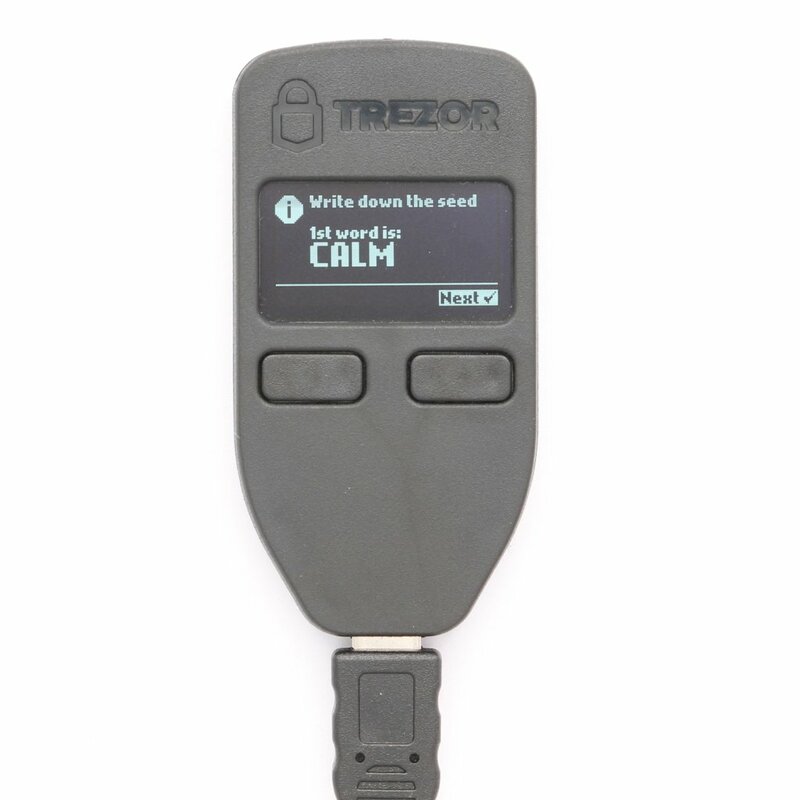 The TREZOR logo is located on the front side, underneath it is the OLED display with a resolution of 128×64 pixels and two buttons underneath, which offer a pleasant pressure point. On the underside is the MircoUSB port for connecting to the device and on the top side an eyelet for a trailer. The back is completely unused. 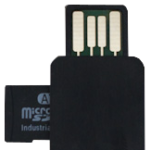 Android supports the USB OTG standard, which allows any Android smartphone from Android 3.1 to act as host and use a USB stick on the smartphone, for example. 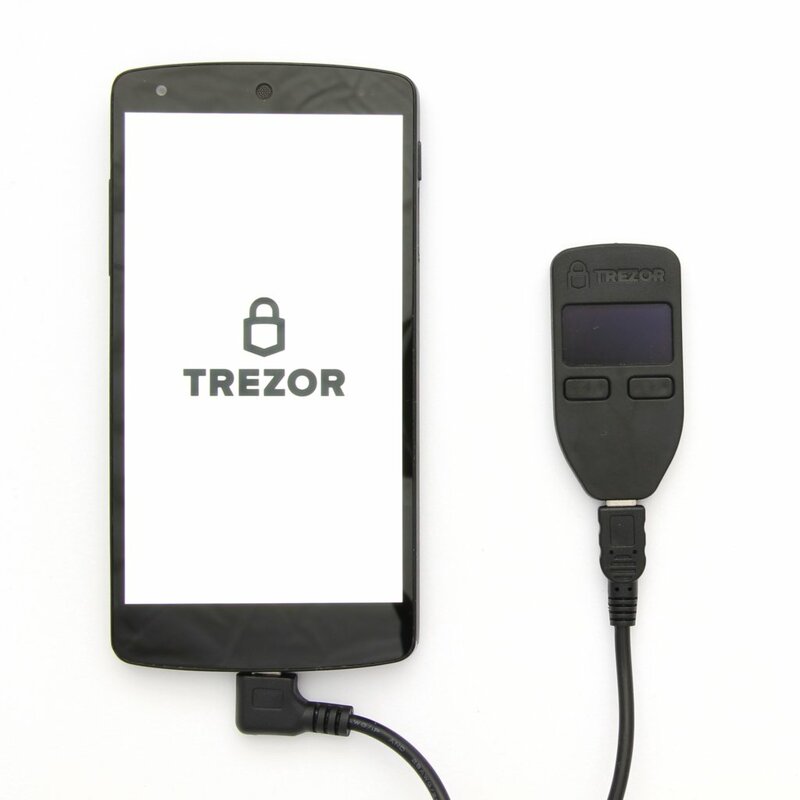 The hardware wallet TREZOR also uses this standard, so that the hardware wallet can be used on the go with an Android smartphone. This cable is not included in the standard scope of delivery and must be ordered as an accessory. 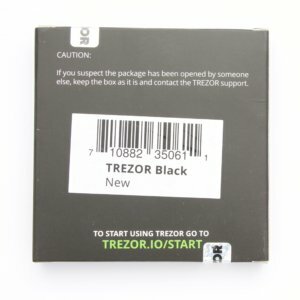 Ordering in TREZOR’s online shop seems to be uncomplicated, only the address data have to be entered and the payment is then made by bitcoin or credit card. Shipping was very fast and without any problems from Prague, Czech Republic. 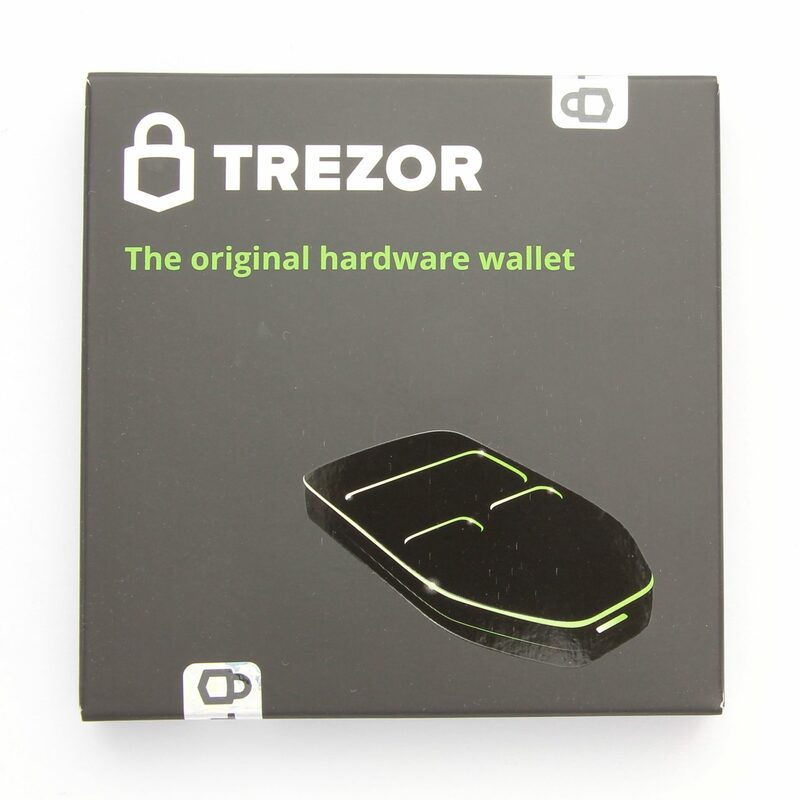 Although the TREZOR Hardware Wallet can also be ordered from Amazon, at the time of the test there they are overpriced. I also think that third party dealers should be treated with caution, as they could manipulate the device including the packaging. Otherwise, the delivery is convincing. I miss nothing and the device looks very well manufactured. The additional stickers are a nice addition. 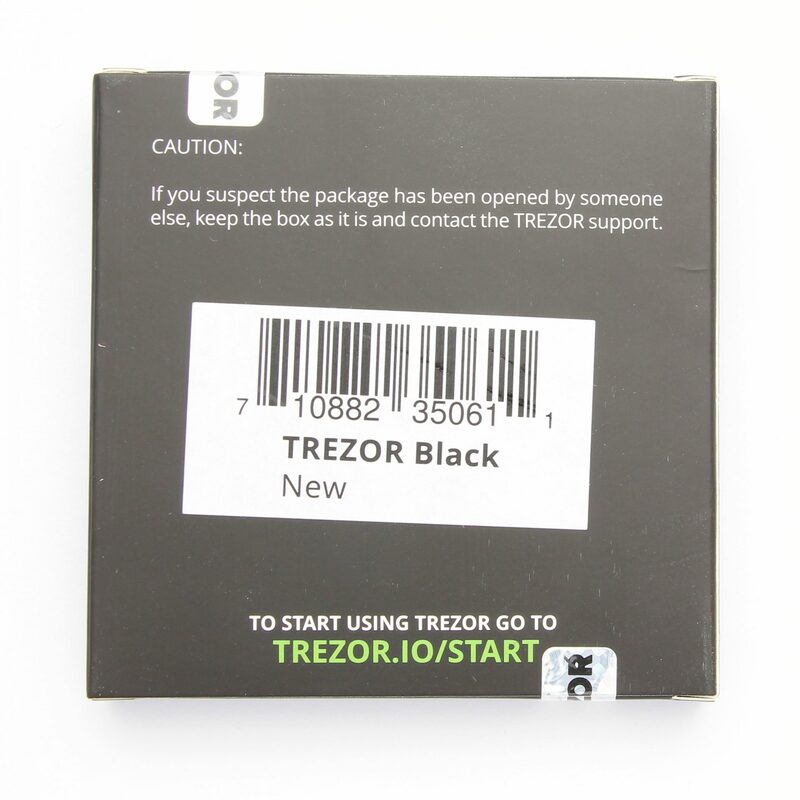 As the back of the carton reveals, the trezor.io/start page must be visited to set up the TREZOR hardware wallet. First of all, there are three points that should be taken into account before setting up the hardware wallet. The PIN prevents unwanted access to your own hardware wallet. Do not use a light PIN like 1234. 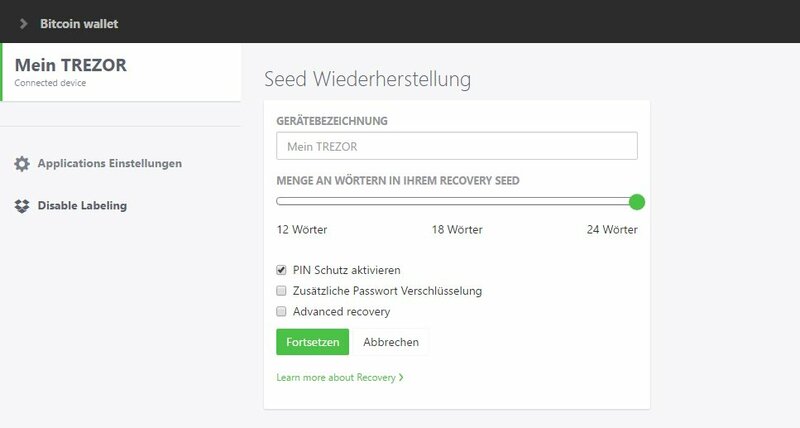 The Recovery Seed represents the backup of the wallet, and must be written off at the beginning of the installation. A digital copy is expressly not recommended. Last but not least, you can sign up for a newsletter to not miss any news. 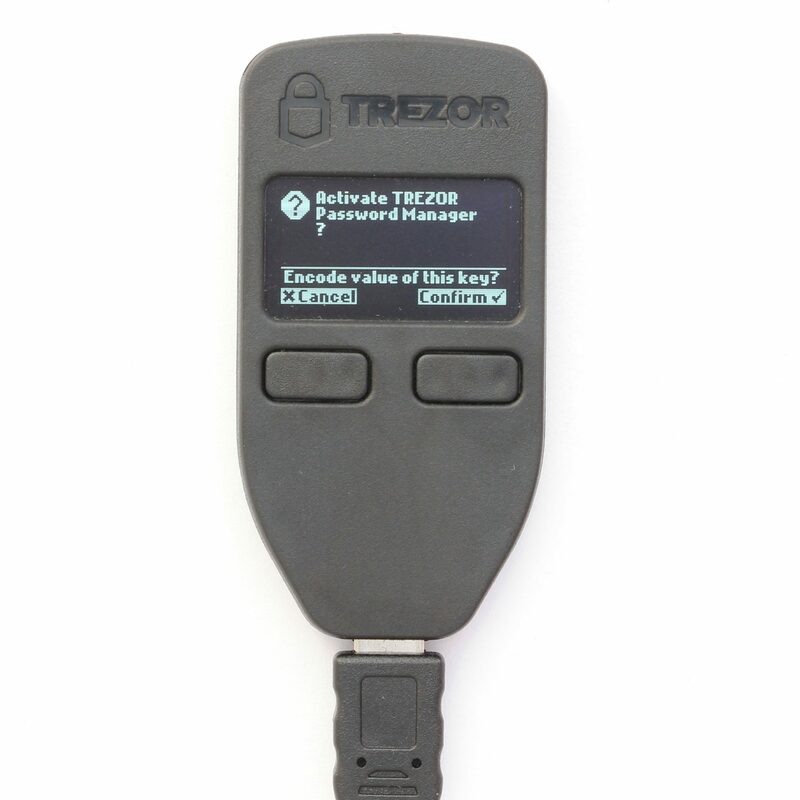 The TREZOR Wallet is the software counterpart to the hardware wallet and is required for setup. It is also possible to set up a mobile device with an Android device. Read more in the compatibility section of this review. 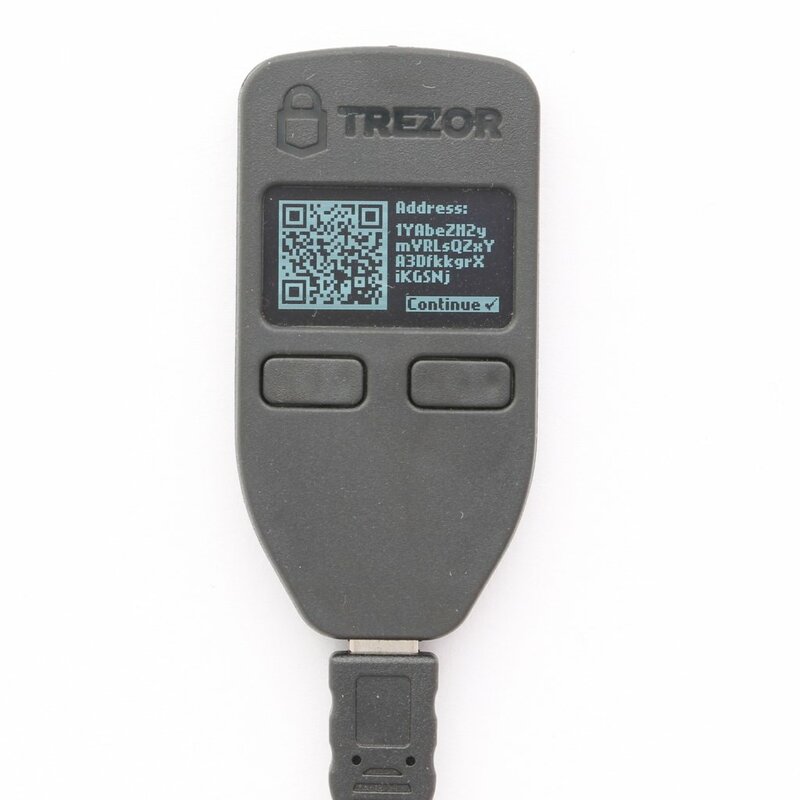 If the extension is installed, TREZOR must be connected. 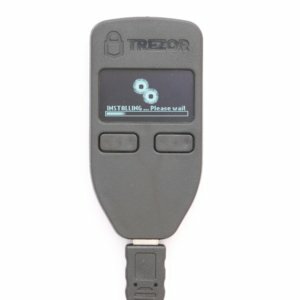 Similar to the ledger, TREZOR does not offer any native software. 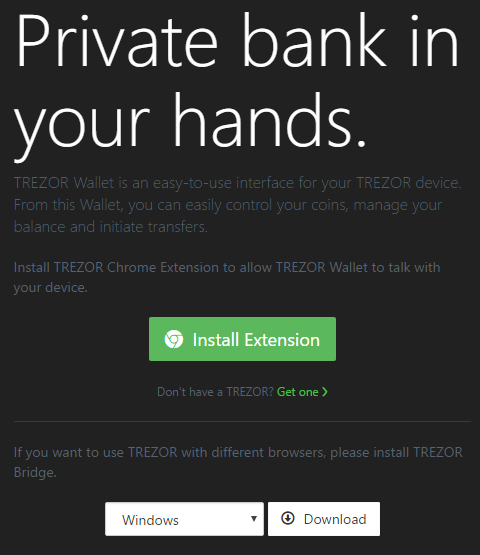 A Chrome extension at TREZOR provides the interface between the computer and the web-based wallet. 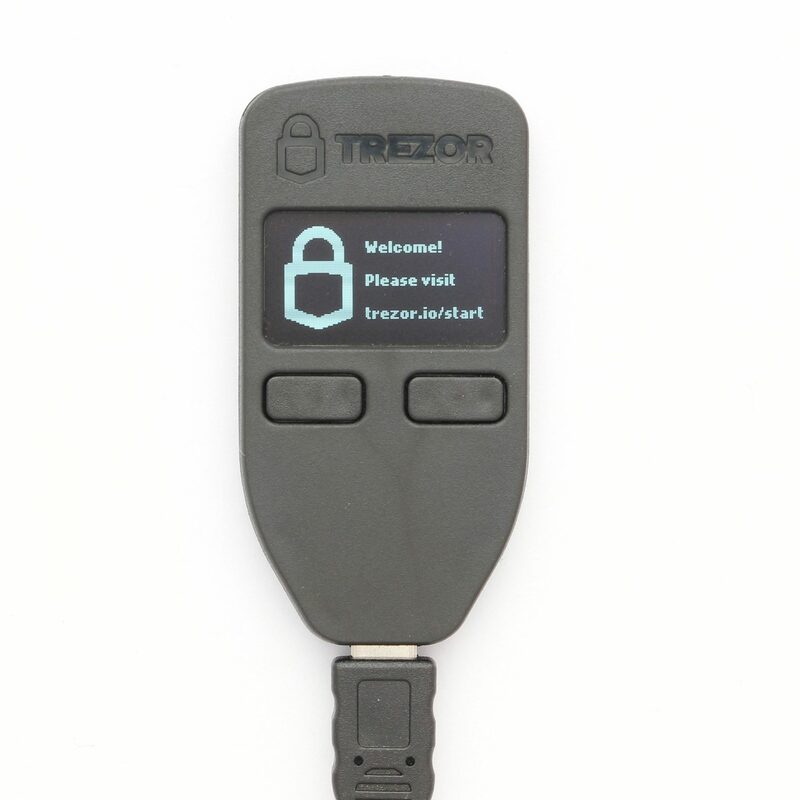 Alternatively, you can also download TREZOR Bridge for Linux, Windows and MacOS, which makes it possible to use TREZOR Bridge with other browsers. 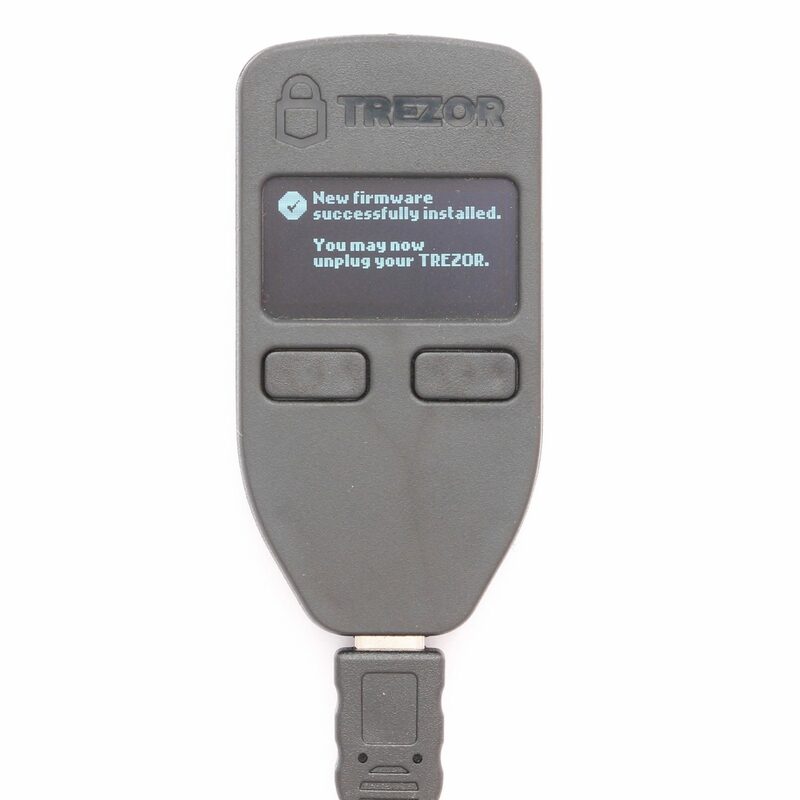 If TREZOR is now connected to the computer as required, the firmware must first be installed. This is not shipped with the device from the factory, but is loaded onto the device during setup. This way you have the latest and safest firmware on your device right at the start. The first hint “Never do this without your recovery card” is intended for later firmware updates. Since we have not yet generated a wallet, we can ignore this hint. It is important to carefully match the fingerprints with those displayed in the browser. If you notice a difference here, you should abort the installation. 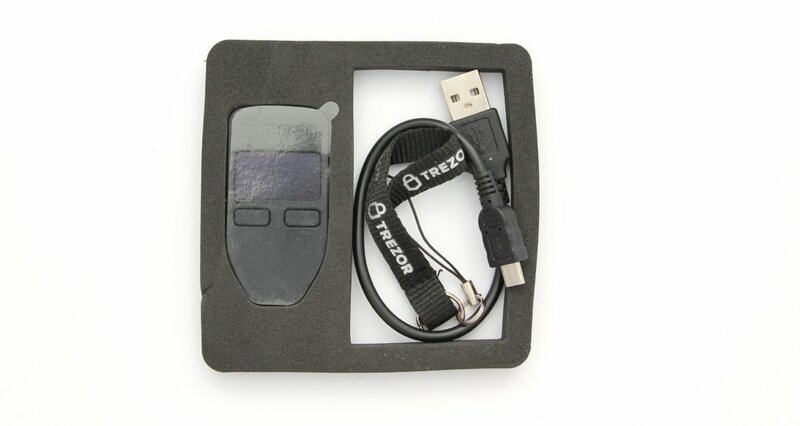 To complete the installation and continue with the setup, TREZOR must be disconnected from the USB cable and reconnected. 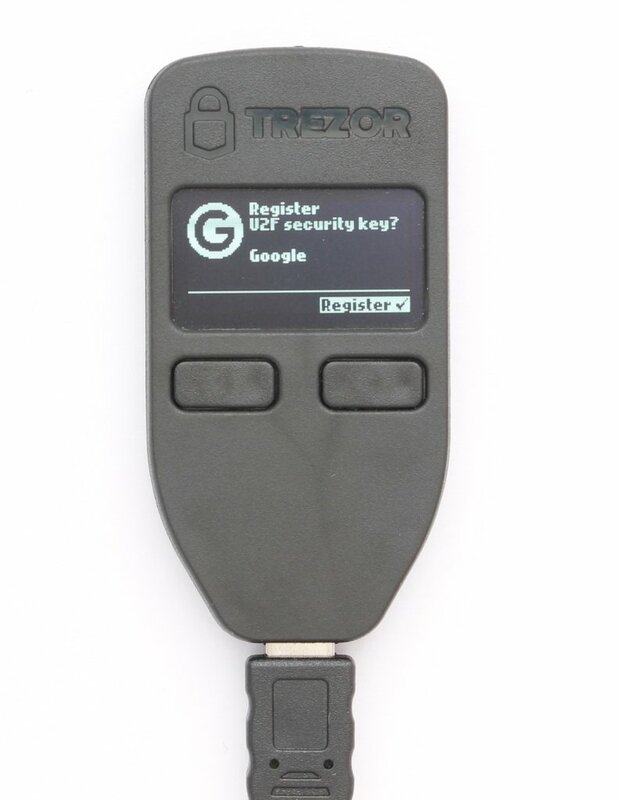 If TREZOR has been reconnected, we can start setup via the TREZOR wallet in the browser. At the beginning we choose a name for the hardware wallet. This can be changed at any time. The PIN is then set. 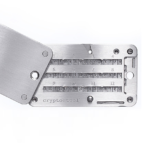 For this purpose, the hardware wallet displays a PIN field with random sequence of the numbers 0 to 9. 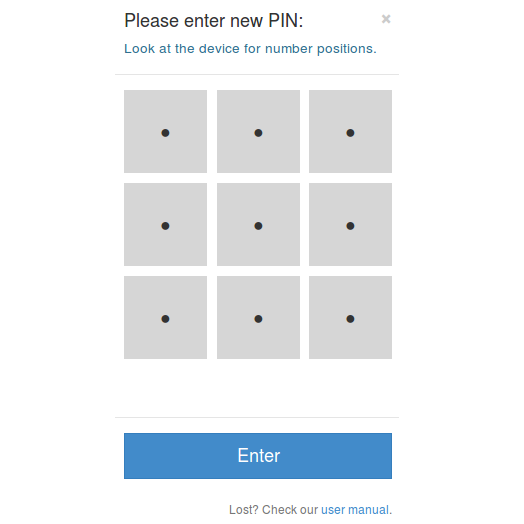 According to this pattern, the individual fields of the desired PIN must now be pressed in the browser. This prevents malware from reading the PIN on the computer. Example: I use PIN 6831, so I click in the browser the field in the top center, then right corner down, then the middle field and finally in the middle. The whole thing has to be repeated a second time, this time with a different PIN field. This means that other fields in the browser have to be pressed again. The PIN can be changed at any time later via the device options. As already read in the first step of the setup, the Recovery Seed represents the backup of the wallet and must therefore be noted down. Now every single word is written in the little booklet from the scope of delivery. As soon as you reach the last word, you have the possibility to go through all the words again. After checking each word, the process can be completed by pressing the right button. The booklet is now kept safe, as it provides access to your crypto currencies. The wallet is already fully equipped. You will be prompted to enter your PIN to unlock and use the wallet. 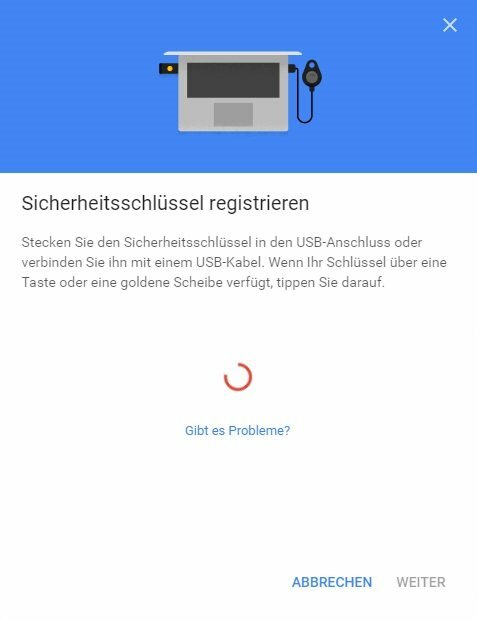 Die Einrichtung der Hardware Wallet ist durch die geführte Anleitung einfach und schnell zu meistern. Dabei wird stets auf umfangreiche Artikel der eigenen Dokumentation verwiesen, sodass eigentlich keine Fragen offen bleiben sollten. 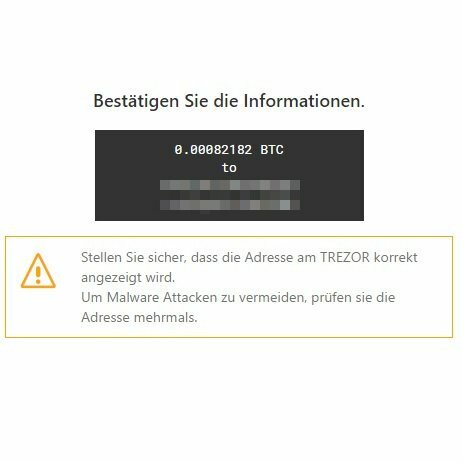 Mir gefällt es gut, dass man durch die TREZOR Bridge auf keinen speziellen Browser angewiesen ist und das die Firmware erst beim Initialisieren auf das Gerät gespielt wird und nicht ab Werk bereits mitgeliefert wird. 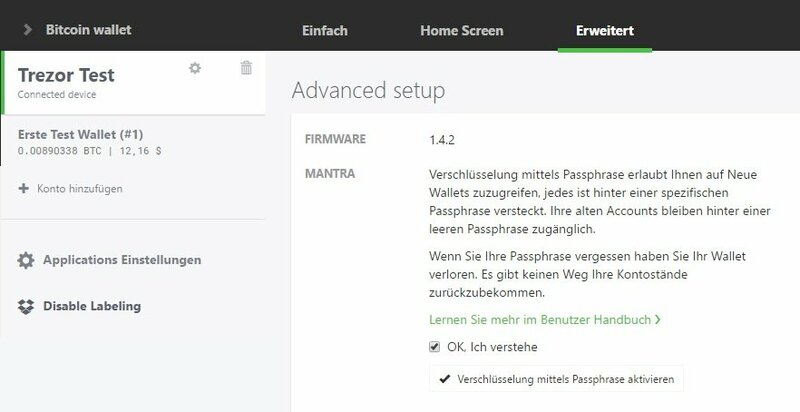 The installation of the hardware wallet is easy and quick to handle thanks to the guided instructions. Thereby there are always references to extensive articles of their documentation, so that no questions should remain unanswered. 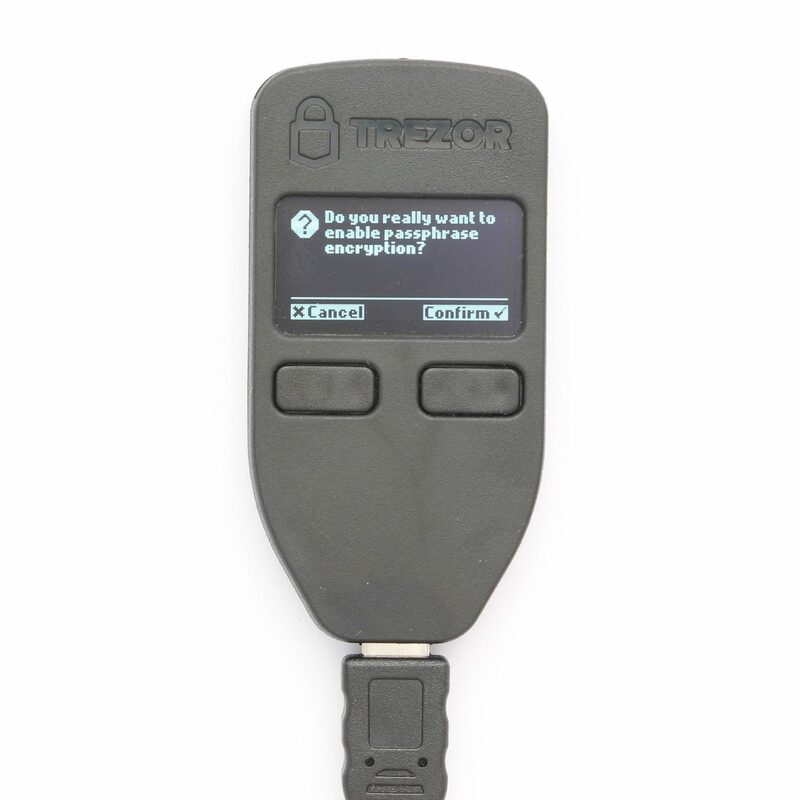 I really like the fact that you don’t need a special browser because of the TREZOR bridge and that the firmware is installed on the device during initialization and isn’t delivered with the device from the factory. 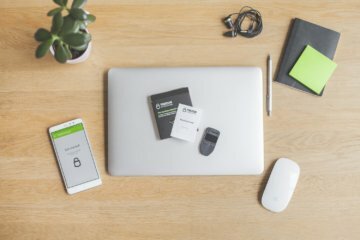 How does TREZOR perform in everyday use? 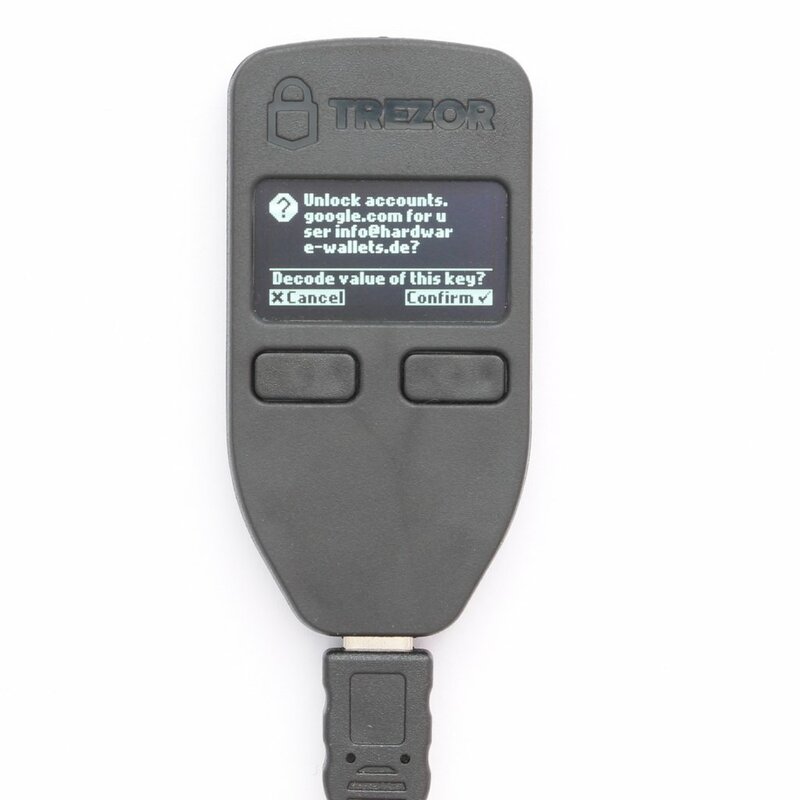 To operate the TREZOR Hardware Wallet, I use the Web TREZOR Wallet. Of course, it is also possible to use it with other software wallets, such as the Electrum Bitcoin Wallet, as you can read in the compatibility section of this review. 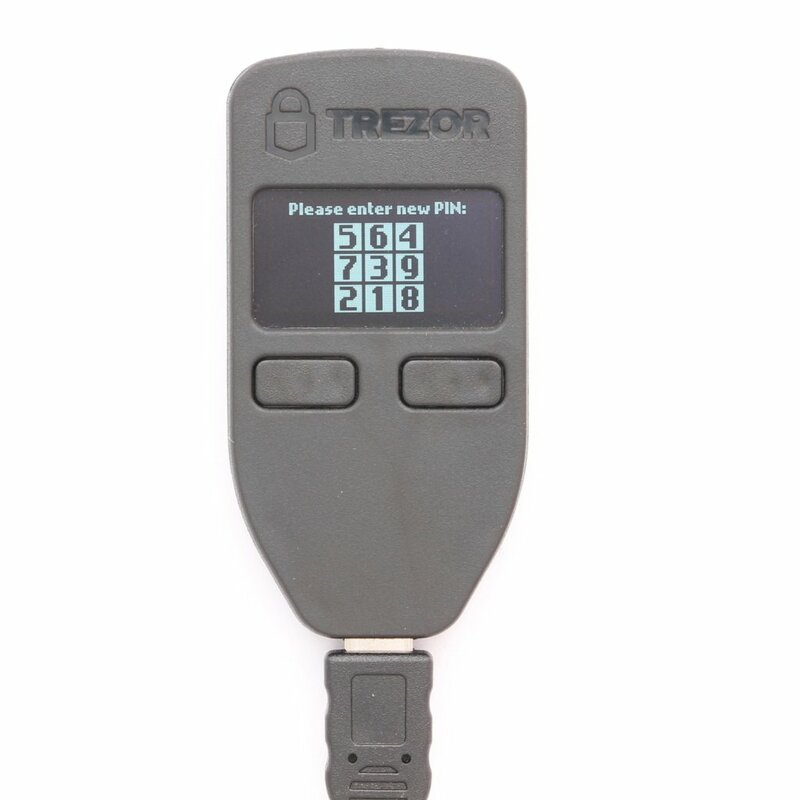 The TREZOR Hardware Wallet allows you to manage different cryptocurrencies. Below I will test with the common cryptocurrency bitcoin. First I send Bitcoins to the unused Wallet. To do this, the software must switch to the tab “Receive”, where one or more new addresses of the current account can be generated. 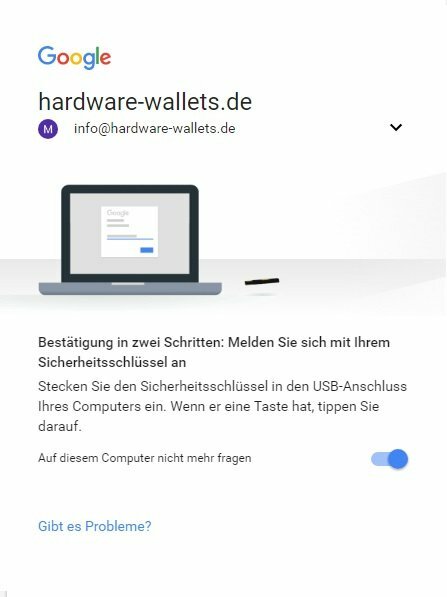 To make sure that the address was actually generated by the hardware wallet and not manipulated, you can click on the eye to the right of the address. This means that the generated address is also shown on the device display, where manipulation of the display can be excluded. 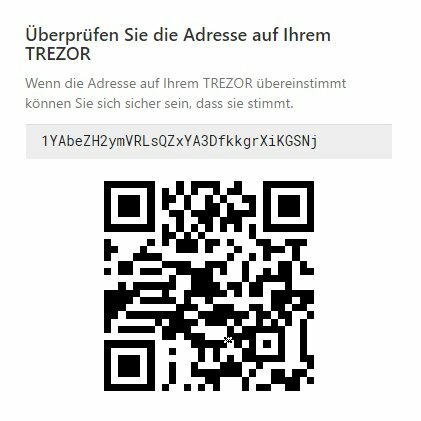 If the addresses match, bitcoins can now be sent to the indicated address. You can either copy the address or use the QR code. 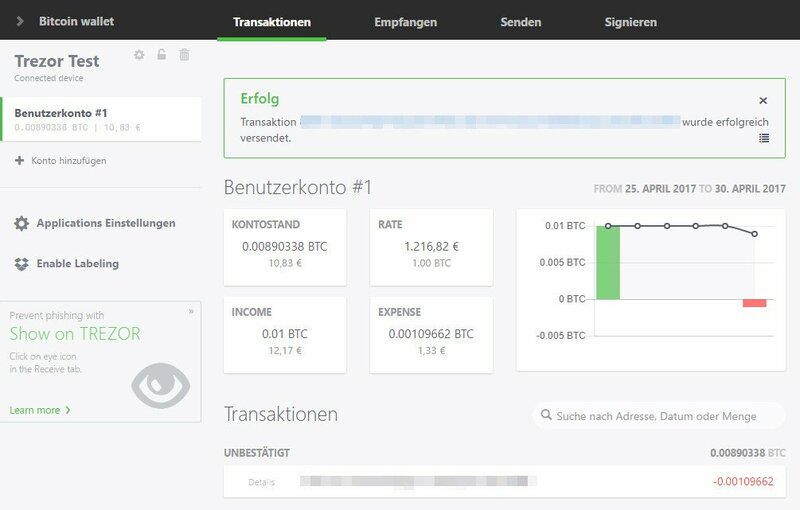 As soon as the transaction has been completed, the transaction will appear on the start page and the balance in the account’s summary will change. If an address was used, a new one is generated for the next transaction. This avoids the possibility of assigning multiple transactions to one wallet. Already used addresses can still be displayed and reused if necessary. The total received coins of an address are also displayed directly below it. To send you switch to the “Send” tab. The form that appears here will be filled out first. First of all, you enter the recipient’s address, either by typing it in directly or by using a webcam. Then you enter the desired quantity, either in Bitcoin or in a different currency like Euro, which is then converted directly. 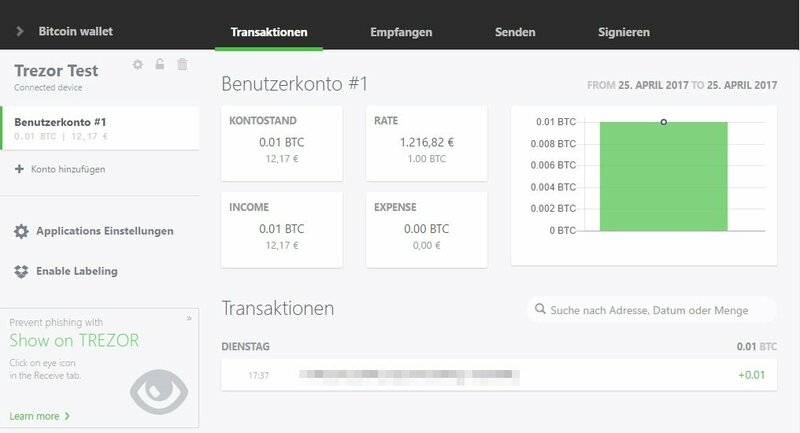 It is also possible to select all bitcoins of an account via the small arrow so that it remains empty. Depending on which fee is selected, an expected confirmation time will be displayed by the network and the amount of costs will be calculated. Optionally, you can display additional transaction details that are displayed in the above screenshot. These include the size of the transaction and the inputs and outputs. It is also possible to send to several recipients at the same time. You can import a CSV file or type in several addresses. This is much more convenient than carrying out several transactions in succession and also saves on fees. 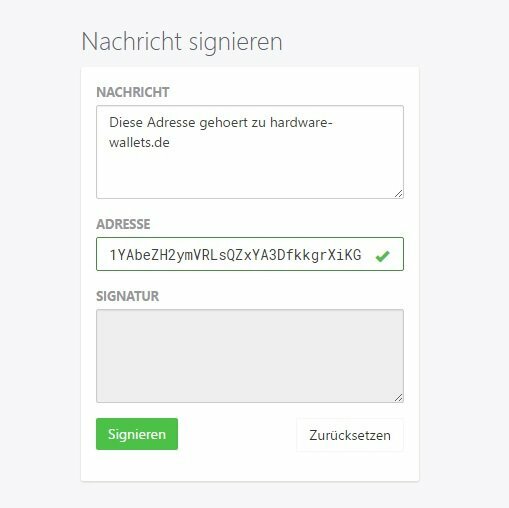 Click the “Send” button to send the transaction to the hardware wallet for verification. 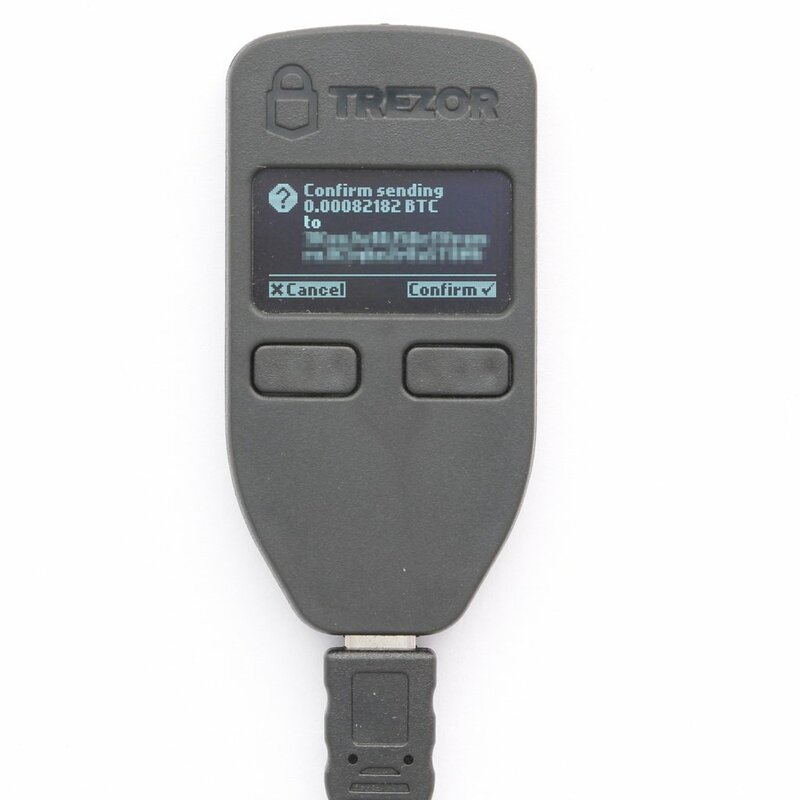 In two steps, the most important data is displayed on the TREZOR in order to exclude manipulation on the computer. If the recipient’s address and the final total match the data entered in the form, the transaction can be confirmed by pressing the right-hand button. 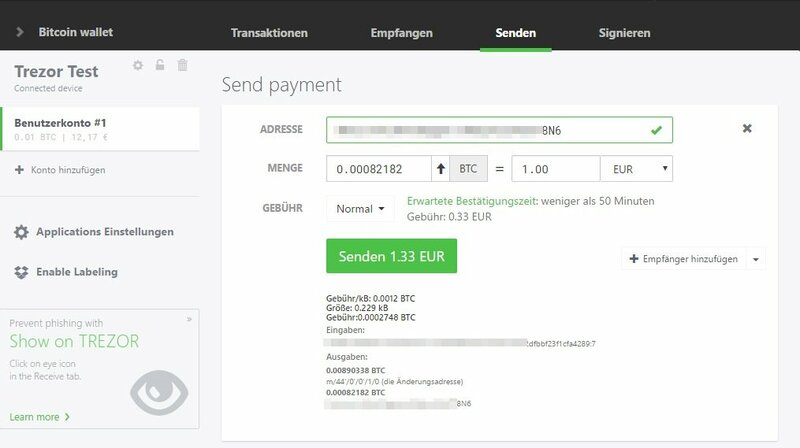 Now the transaction is sent to the network and a new negative entry appears in the transaction view. Until now, all transactions have been processed through the first default account “User Account #1” of the Wallet. 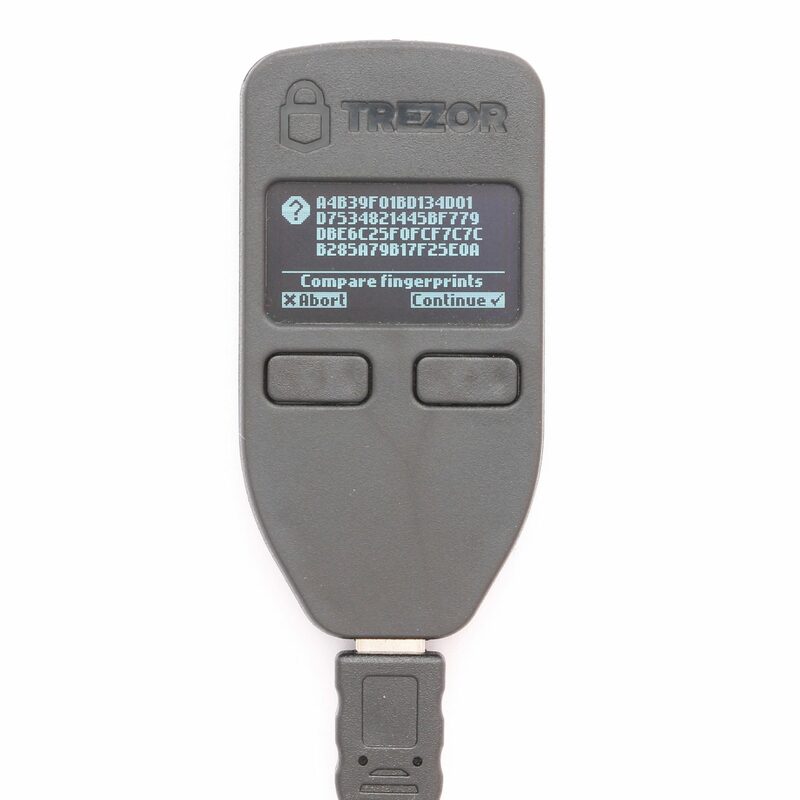 TREZOR also offers the option of creating additional accounts, for example to separate private from business transactions. 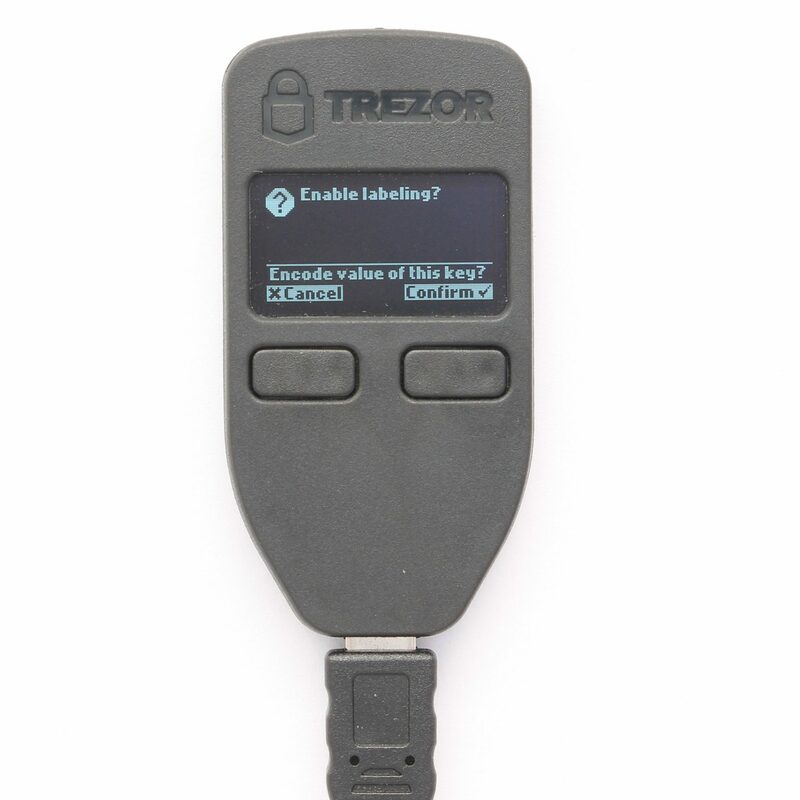 Or if you want to create separate accounts for different people working with the same TREZOR. The accounts are based on the same seed and therefore do not need their own recovery key. Nevertheless, the accounts can be used as independent wallets: each account has its own address range and balance. Renaming is possible with a dropbox connection. 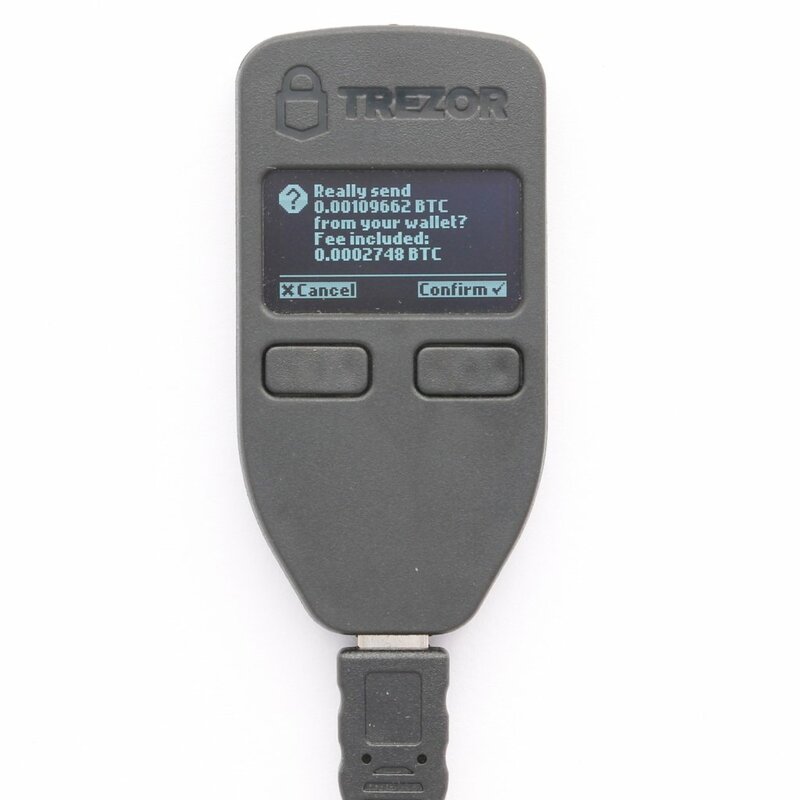 TREZOR supports Bitcoin’s ability to sign and verify messages to confirm the ownership of an address without any doubt. To do this, switch to the tab “Sign”. There are two forms available in the tab “Sign”. 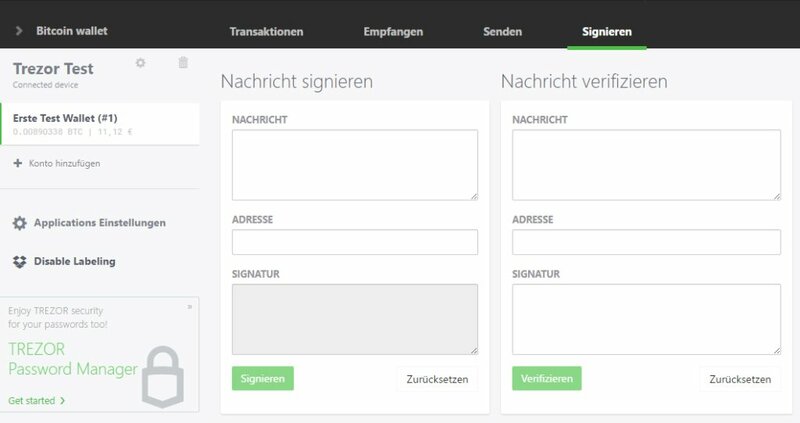 You can sign your own address using the form on the left. The generated data is then passed on to the corresponding recipient. The user can now enter and verify this data using a TREZOR, for example, using the right-hand form or any other tool. If no error occurs, the owner of the address was confirmed. 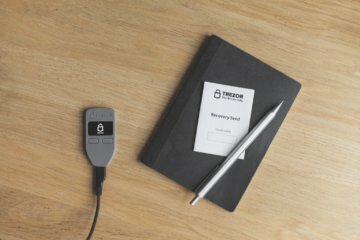 TREZOR provides its own Password Manager Chrome extension. This makes it possible to store all your passwords securely encrypted in the free cloud service Dropbox or Google Drive. 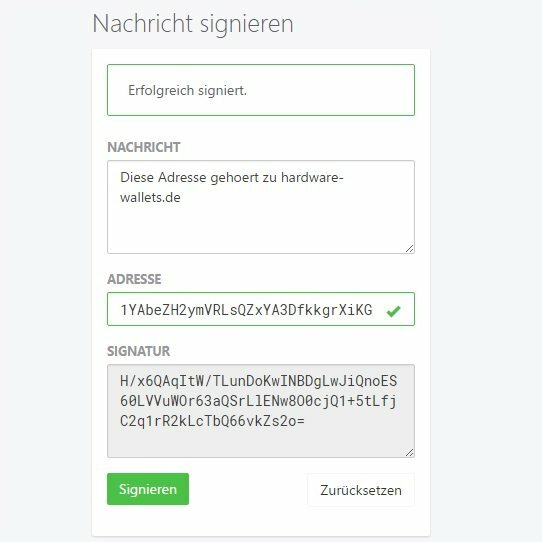 The password-keys were generated on the hardware wallet, making it impossible for others to access your passwords. At startup, you must either grant TREZOR access to Google Drive or Dropbox and confirm the activation of the password manager directly on the device. As soon as everything is properly connected, you can create new passwords and sort them according to your own categories. 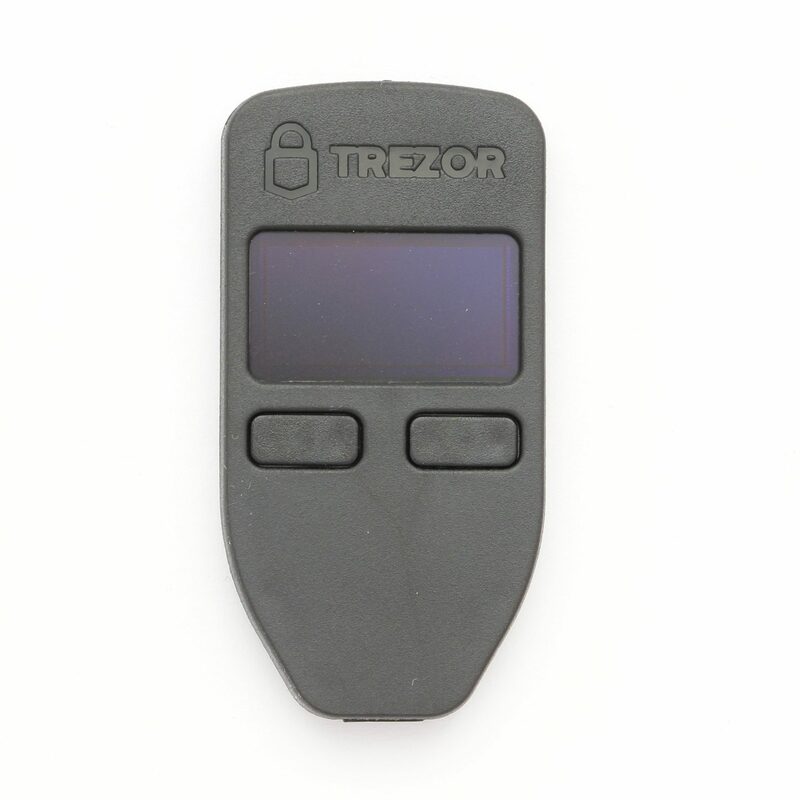 If you want to copy a user name or password to the clipboard, you have to confirm the action on the hardware wallet TREZOR by pressing a key. 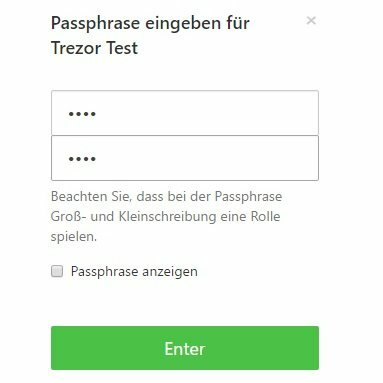 By clicking on the icon or the name you can also go directly to the page and TREZOR will try to fill in the login form automatically. 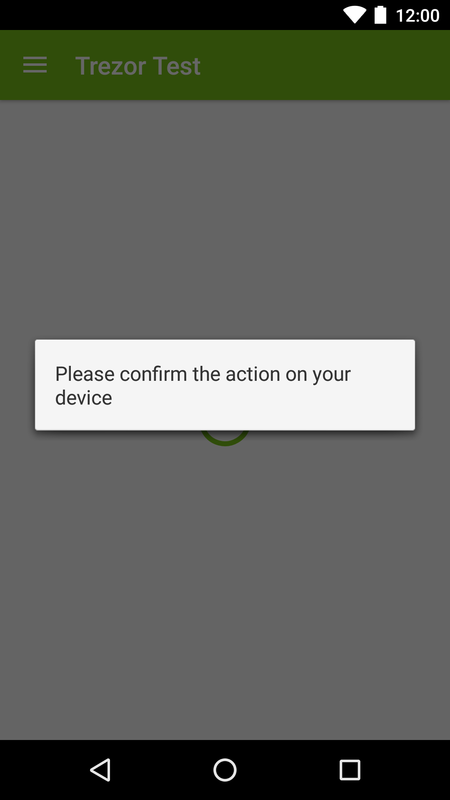 Again, the action must be confirmed on the device. 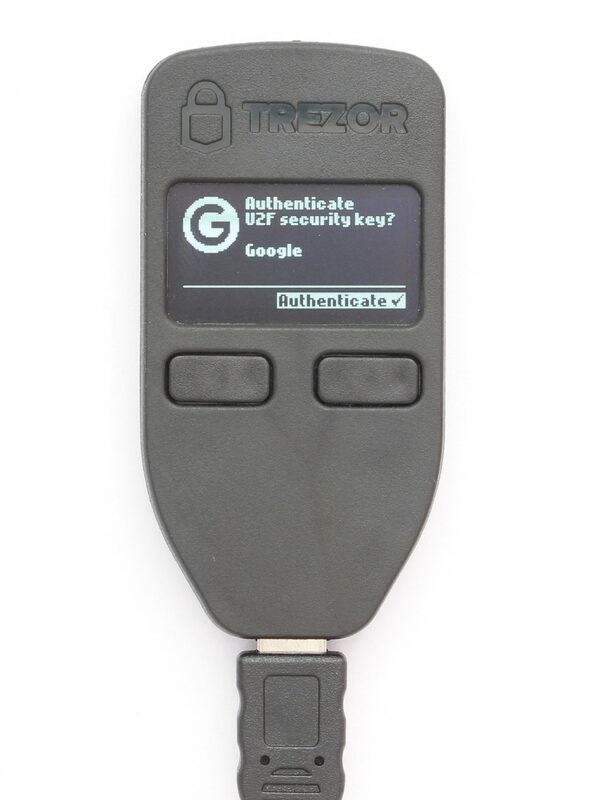 Like many other hardware wallets, TREZOR supports the industry standard U2F. In addition to an access password, this serves as proof of access authorization, e. g. for web-based services, and can also be used in combination with digital personal documents to establish identity. U2F is completely detached from any other functions of your hardware wallet. You don’t need to worry about the passwords or cryptocurrencies you manage with TREZOR. To activate U2F, TREZOR must first be notified of the corresponding service via the settings. For example at Google you find this in the Security Center. 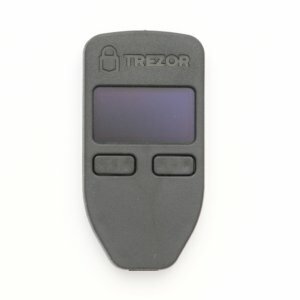 Once TREZOR has been configured as a second factor, the hardware wallet has to be available for the logon. 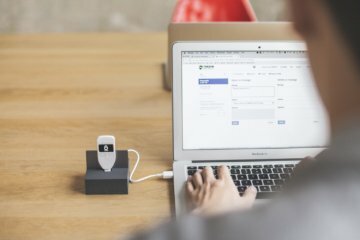 You can connect TREZOR to the free cloud service Dropbox. This makes it possible to rename accounts, describe addresses and transactions and use the full text search. This data is then stored in an encrypted form in Dropbox and is only accessible through your hardware wallet. To activate the connection, click on “Enable Labeling” in the menu on the left. A message appears with further information and the action must be confirmed by pressing a button. The App settings are linked directly above the labeling on the left side and are valid for one App within the Wallet, e. g. for the Bitcoin App. Here you can set the fiat currency or change the URL the wallet communicates with the network. To get to the device settings, click on the gearwheel next to the device name. These settings are independent of the app and therefore apply to all wallets and crypto currencies. Here you can first change the device name and PIN. The Extended Public Key can also be exported, allowing you to view the entire transaction history of this wallet. 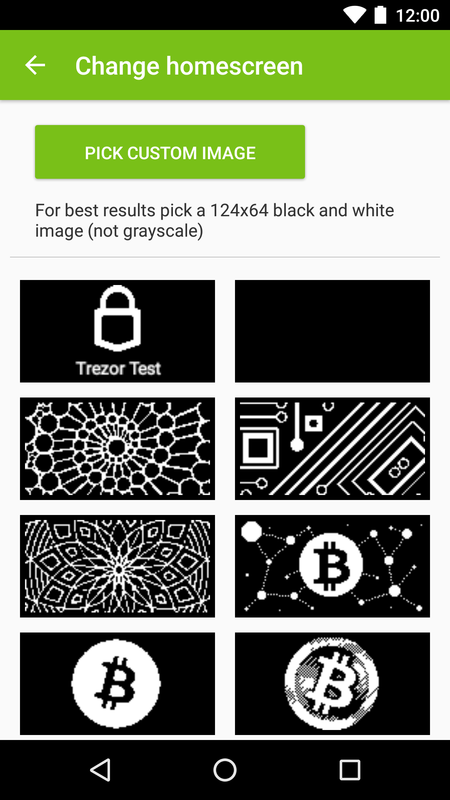 Clicking on the tab “Home Screen” allows you to change the background that appears on the hardware wallet. Under the tab “Advanced” you can set up a hidden wallet, deactivate the PIN completely or reset the whole device. 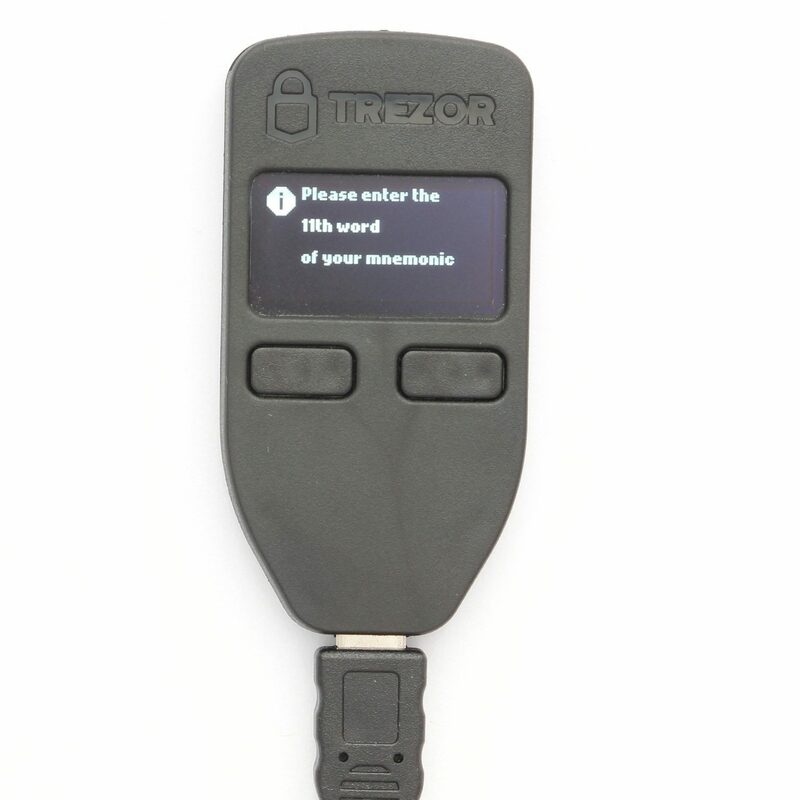 The TREZOR Wallet leaves nothing to be desired in terms of functionality and operation. If a function is not clear or if there are questions, the extensive documentation helps immediately, which is very positive. The basic functions such as sending and receiving work without any problems and offer all important actions, such as emptying a wallet or converting directly to another currency. 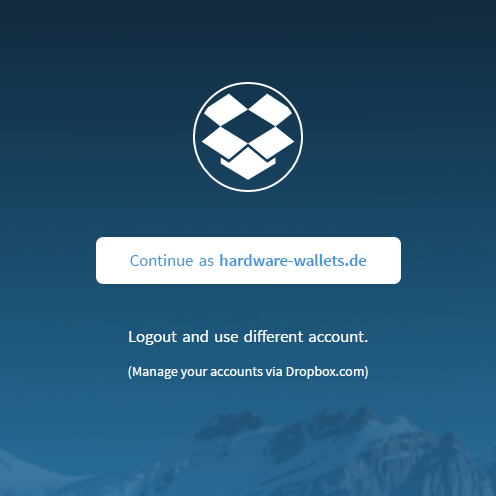 Also the simple administration of accounts and the easy way to describe each address or transaction by a connection with dropbox are very helpful functions. 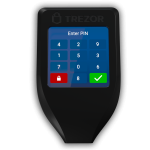 Additional functions such as a fully functional password manager, the use of the TREZOR Wallet as a universal second factor or the signing of messages still set it apart from its competitors. 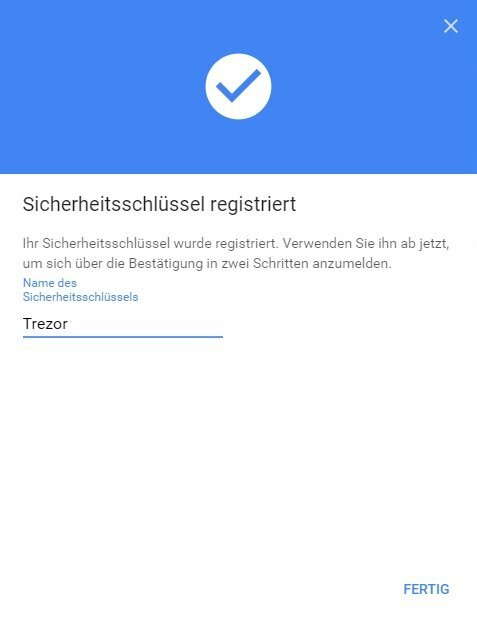 It is worth mentioning that TREZOR even allows you to set up the hardware wallet via an Android smartphone using the TREZOR Manager app. You can find more information in the sub-section “Mobile use”. MacOS is supported from version 10.11 (“El Capitan”), Windows from version 7. For example, in the case of ledgers, a computer is always required to set up the wallet. 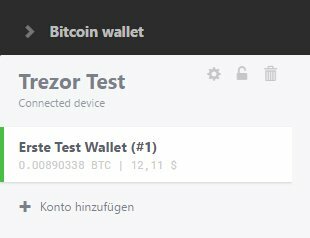 Not all cryptocurrencies are supported directly by the TREZOR Wallet software from SatoshiLabs, but only partly by third-party software. You can easily switch between them via a drop-down menu via the web interface, without any interaction at the hardware wallet itself. 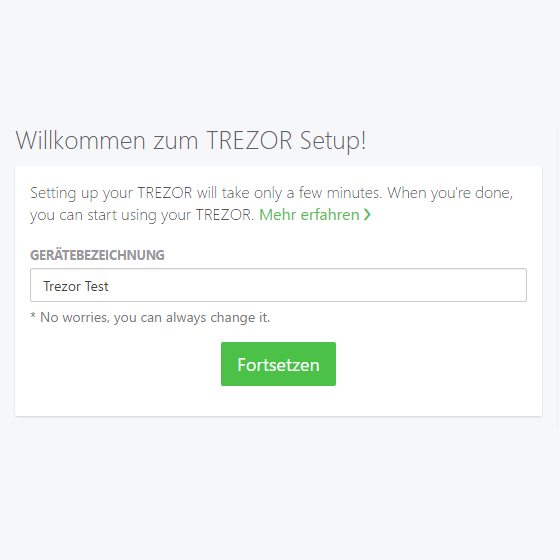 The TREZOR Wallet software only supports Bitcoin-like coins. 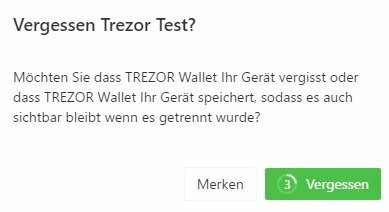 For example, if you want to manage Ethereum via the TREZOR Wallet, you only get a hint that you should use another service, in this case the MyEtherWallet. TREZOR enjoys great popularity among users of cryptocurrencies, which is why there are so many TREZOR apps. 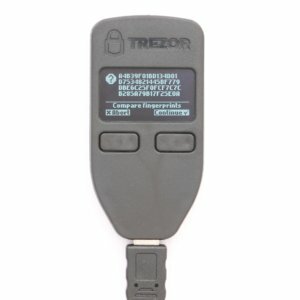 These are software or online services that have integrated TREZOR support via the official API. 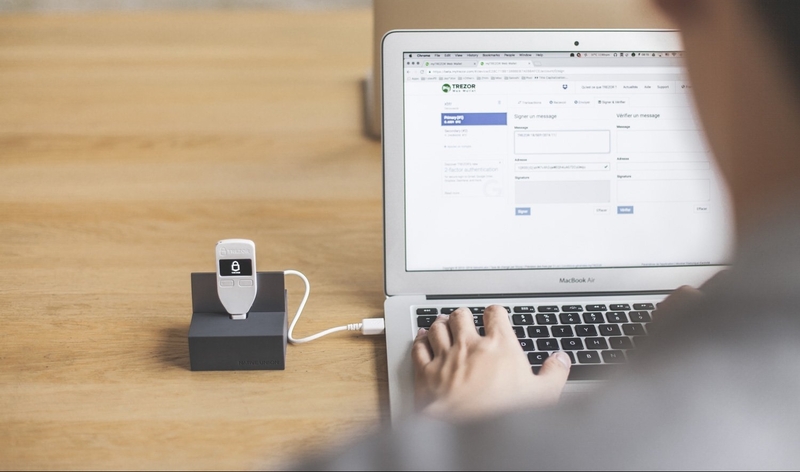 This allows you to interact directly with the hardware wallet via the website of the online exchange Bitstamp or use other software wallets such as Electrum or Copay. 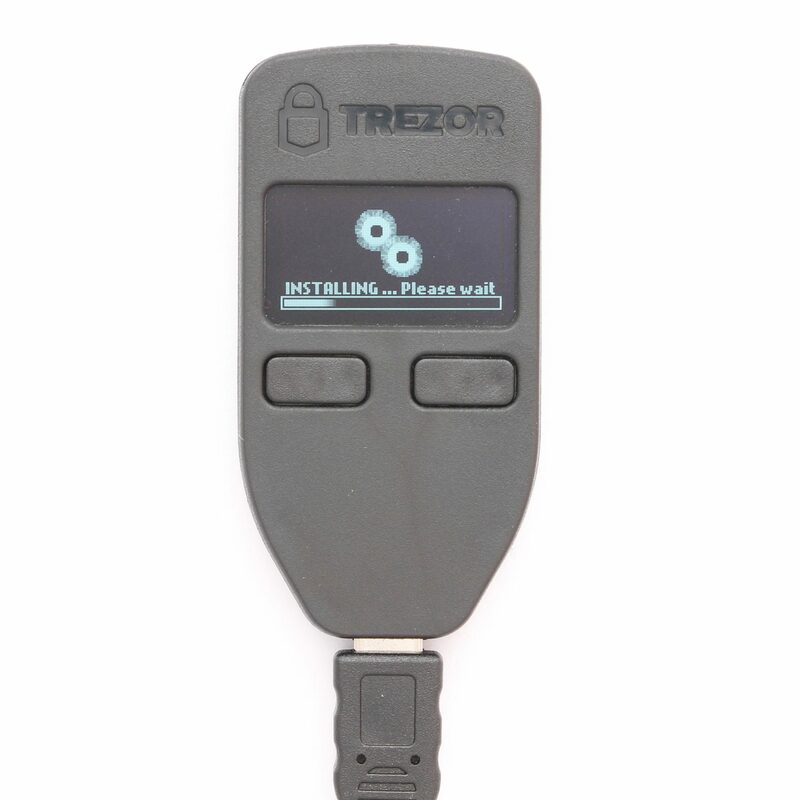 A complete and up-to-date list of all TREZOR apps can be found in the official documentation. 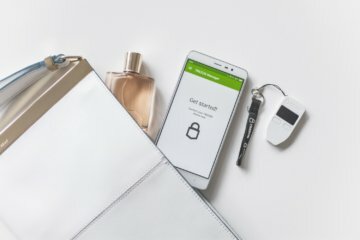 SatoshiLabs, the manufacturer of the TREZOR Hardware Wallet, provides an Android app called TREZOR Manager. This app works with all Android smartphones that support the USB OTG standard. 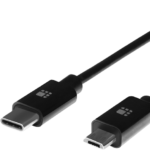 For use you also need a special USB OTG cable. At the time of the test, the app can only be used for initializing the device, restoring the device, setting up the PIN code and password, and some other settings. To unlock, the PIN is entered. On the go you have to enter a PIN code and confirm each action on the hardware wallet. 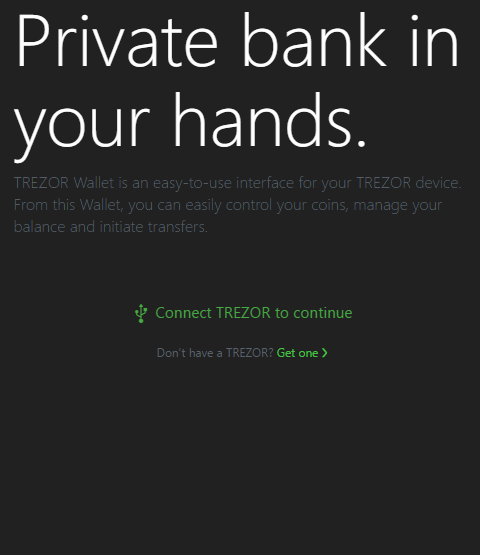 Just as you know it from the TREZOR Web Wallet. If you want to make mobile transactions, you have to switch to other apps, such as the Mycelium App. 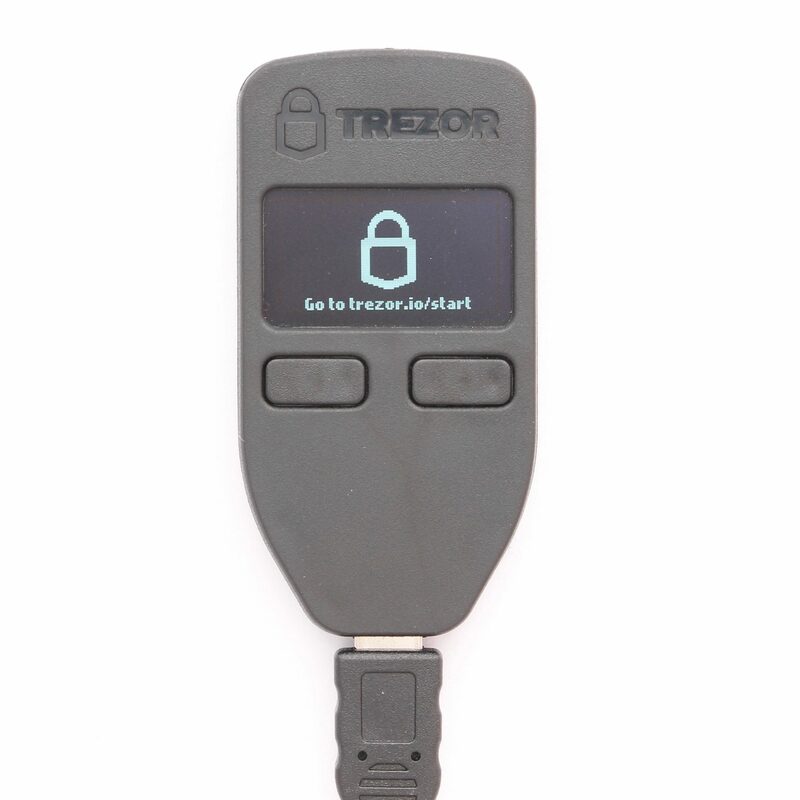 The TREZOR hardware wallet supports altcoins as well as a lot of other software and services. It is possible to switch between the individual cryptocurrencies directly via the software, without any interaction at the hardware wallet itself. It’s a pity that you have to switch to another service to use Ethereum. 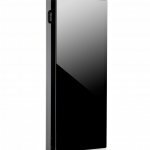 A big plus point is that the hardware wallet works without a computer if you own an Android smartphone or tablet. 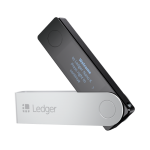 Unlike other hardware wallets such as Ledger or the Digital Bitbox, it is not necessary to enter a PIN or password directly for read access to the wallet. 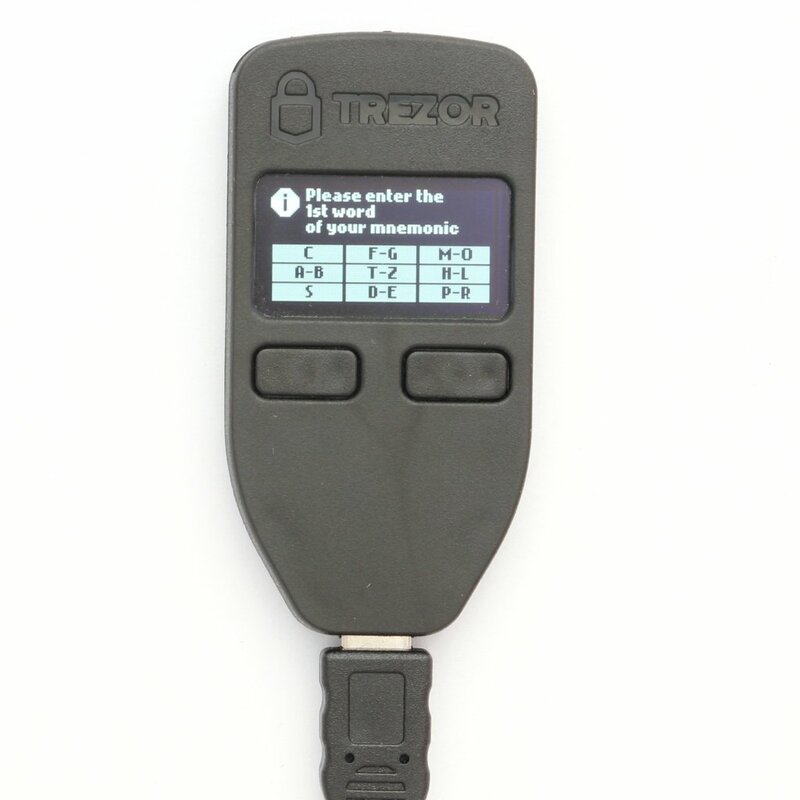 The TREZOR Wallet is able to memorize a TREZOR device. This means that you can use the software without having to connect a device and without entering a PIN, for example to view transactions. On the one hand, this is extremely handy for computers that are used by only one person. On public computers, however, you should always disconnect your TREZOR correctly and release it to forget, so that the successor cannot see your account balance. As soon as you want to do more than just read, you will be prompted to connect the wallet and enter your PIN. The hardware wallet remains unlocked for 10 minutes, so you don’t have to re-enter the PIN for every action. TREZOR is unlocked (shown by the open lock), to forget the wallet until the next connection you can click on the trash can. 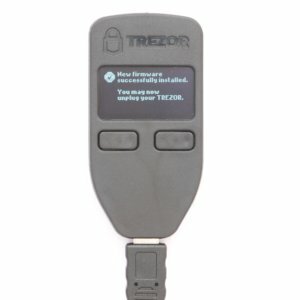 TREZOR can also be disabled manually at any time if, for example when you leave the computer within 10 minutes. 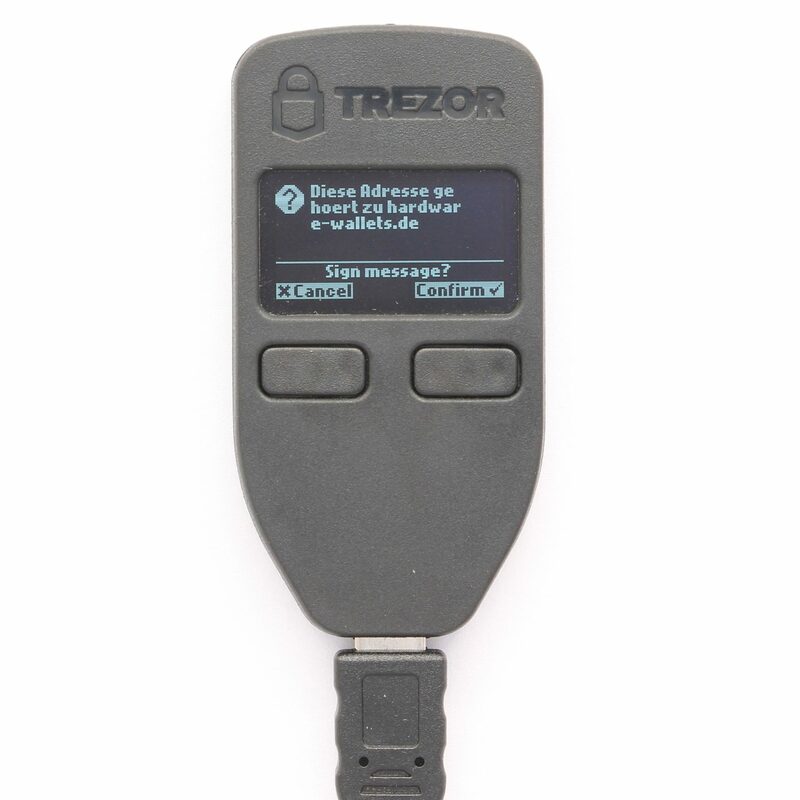 It is also possible to forget the TREZOR on this computer by pressing a button until it is connected the next time. In addition to a PIN, it is possible to add a password to TREZOR. 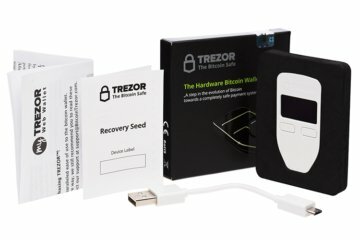 This has the advantage that TREZOR is insensitive to physical attack. Even if your hardware wallet was stolen and the chip was scanned under an electron microscope, your bitcoins would still be safe. As a password you can choose any word that you can remember, because you shouldn’t write it down. Each password unlocks its own wallet, so that even in the event of blackmail, a different password can be issued with little money. A limitation of the password approach is that you have to enter your password using the computer keyboard. For this reason, you should not deactivate your PIN, even if you use a password! To activate it, change to the device settings and activate the encryption by password. Once the encryption has been activated by a password, you have to reconnect the wallet. Now enter the PIN as usual and then enter a password. It doesn’t matter which password is entered, because each password always opens a different, functioning wallet. Of course, you should still commit yourself to one thing that you use for your daily transactions. But a second password is imaginable, for example, to which you only send a few coins and give them out in case of blackmail. 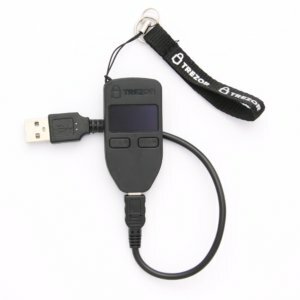 The Recovery Seed was recorded at the time of setup, which should restore the generated wallets in case of a failure, theft or forgetting of the PIN. 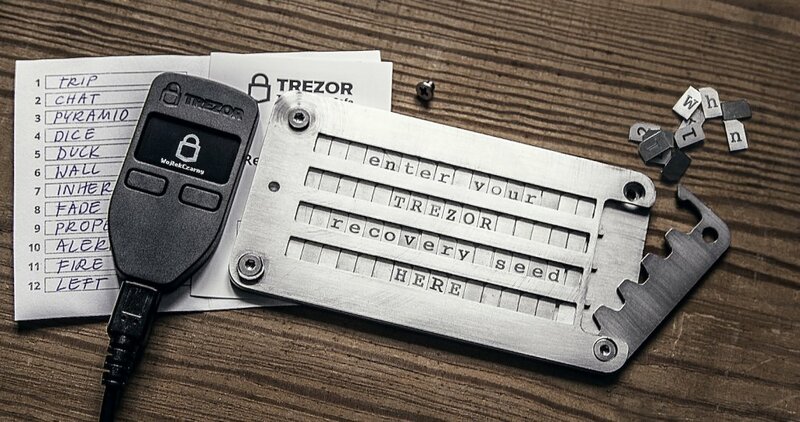 The recovery can be started directly with a new hardware wallet or you can use a software wallets that support recovery with a 24-word recovery seed. 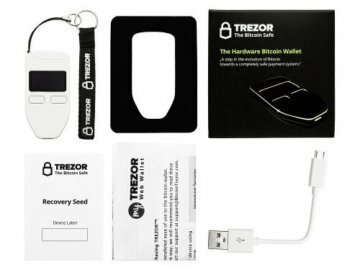 In the following I will test the recovery with the help of a new TREZOR. 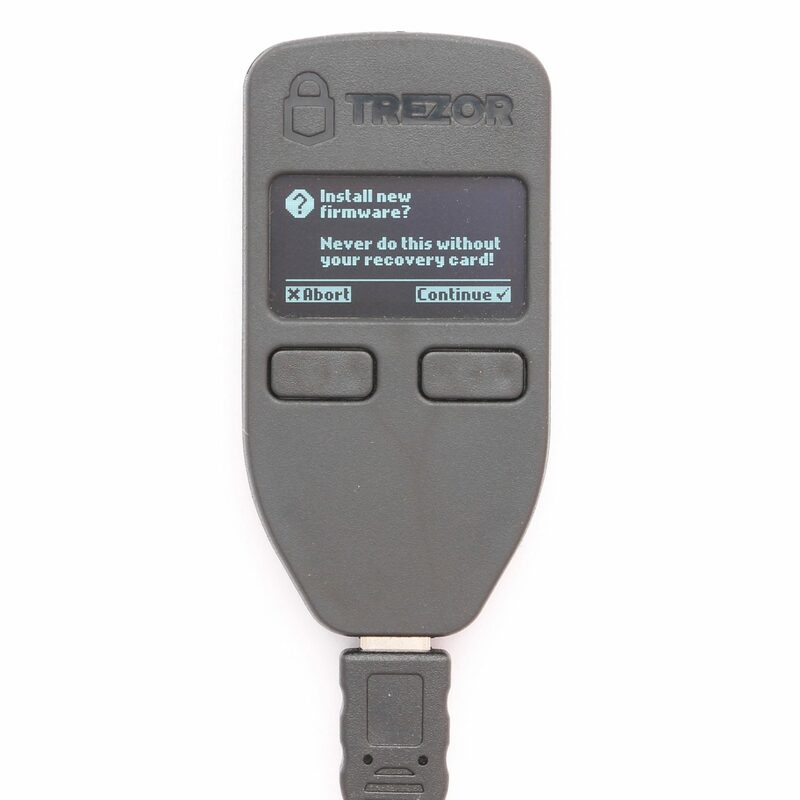 Instead of specifying a name, this time you choose the button “TREZOR Recovery”. Instead of the normal setup, this time you select the restore option on the right side. 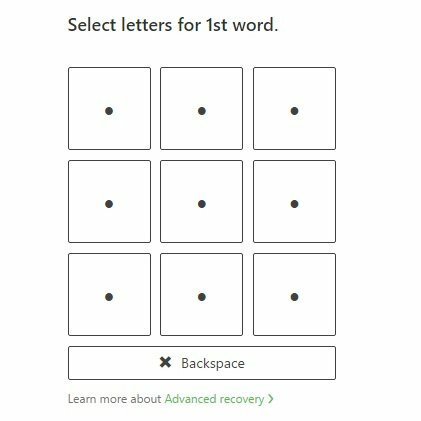 Again, a name is first set and then the number of words that make up the Recovery Seed is selected. If you select PIN and password, they must be entered as usual. Advanced Recovery is also available for recovering the words by clicking on them with word fields, similar to the PIN, rather than using the keyboard. This method increases security because no keylogger can read your words. However, since the words are queried randomly in standard mode, even with known words, testing all combinations is extremely time-consuming. 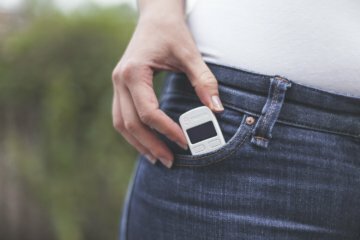 TREZOR has published a blog post about this. In most cases, the default restore mode is therefore perfectly adequate. 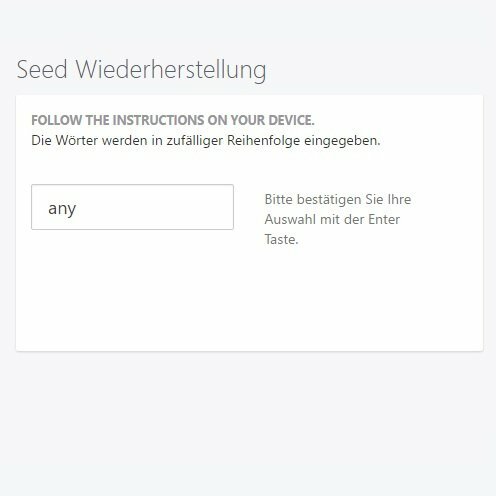 With “Continue” the setting of the PIN and password starts and finally the input of the Recovery Seeds. No matter which input method you choose, once you have correctly typed in the last word, the wallet is restored immediately. As usual, you only have to enter the PIN and the old account balance is restored. TREZOR is completely open source, i. e. any code can be viewed. This makes it theoretically possible for everyone to rebuild the entire product 1:1 and also to test the software for possible back doors. 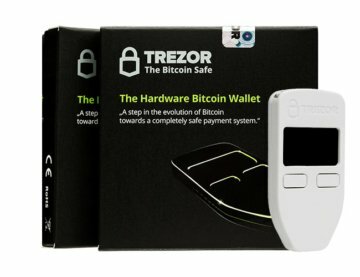 TREZOR is one of the largest manufacturers in this market and has many satisfied customers. 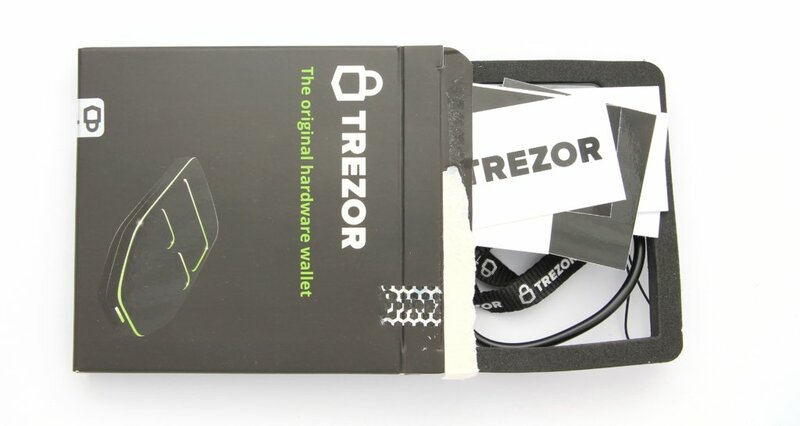 Like any other hardware wallet, TREZOR is able to convince by the fact that the seed of the HD Wallet is generated on the device and never leaves the device except for the backup. This already guarantees a high degree of safety. 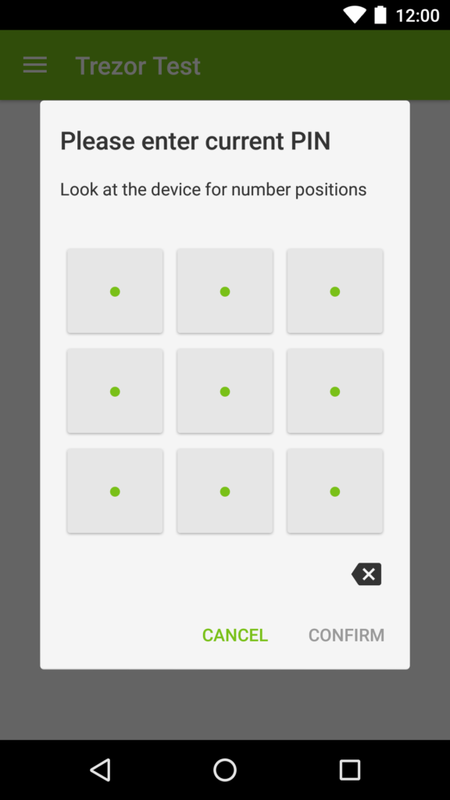 The PIN input always uses a random number field, so the PIN is not readable by a PC. The option of password encryption provides additional security. Restoring the wallet is easy and works without any problems. 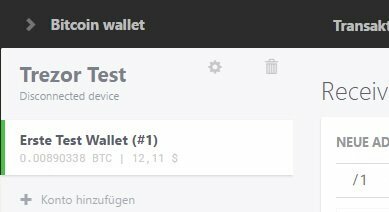 The ability to read your own wallet on trusted computers without a connected hardware wallet is very handy, but should only be enabled on private computers. 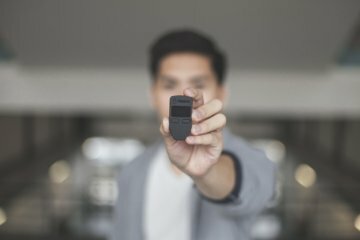 You already have experience with the product "TREZOR One"? Then I am looking forward to your rating!